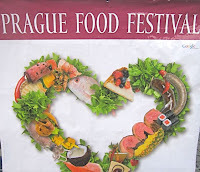 For me, the Prague Food Festival is a "must do" event. It offers a unique, yearly opportunity to sample the creations of a wide range of restaurants all in one place, usually for reasonable prices. That said, I almost didn't make it. My plan to go on Saturday got derailed at the last minute, and I lost most of the day on Sunday. I finally showed up at 6:30 p.m Sunday night. I was glad to see that most of the restaurant stands were still fully operational. This year's location, Prague Castle's gardens, worked well. 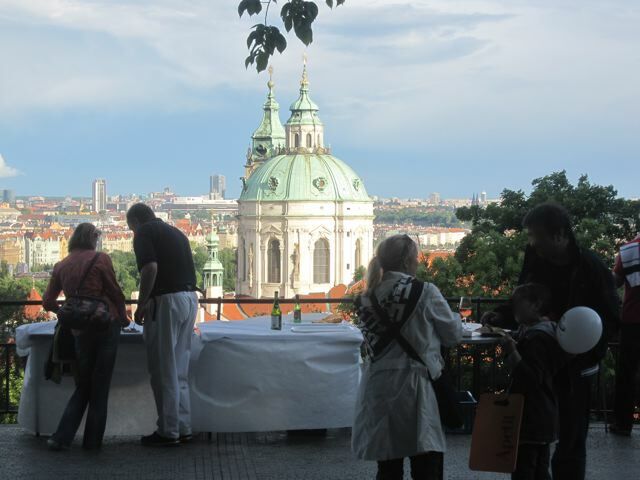 The garden itself is beautiful, but there are also fantastic views of St. Nicholas church and the city below. There was plenty of open space. I heard that lines for food on Saturday were usually not too bad at peak times, with waits of about 5 to 10 minutes. It was the same when I was there. 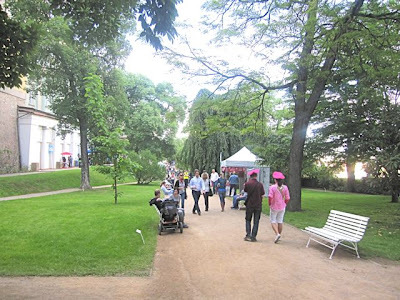 However, a friend said the main entrance gate was closed for at least 90 minutes early Saturday evening because organizers thought there were too many people inside. It sounded very frustrating. 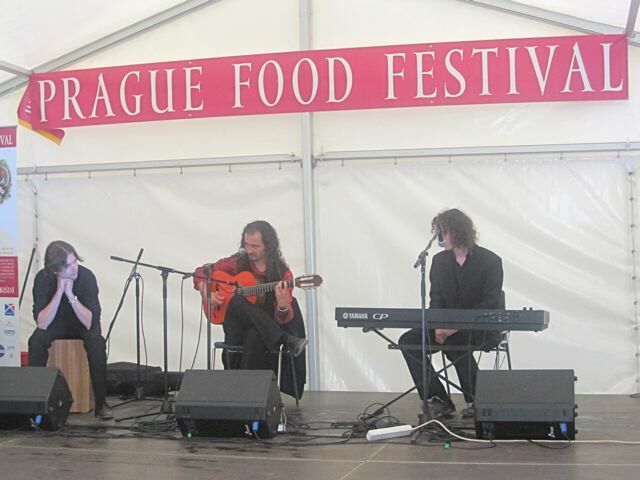 Last year's festival location, on the river near the Charles Bridge, was too small, which caused frustrating crowd bottlenecks. 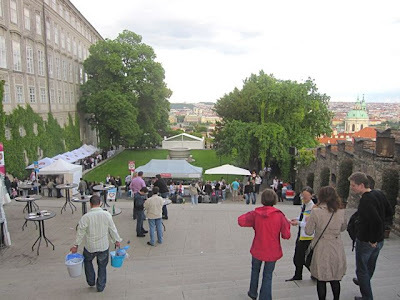 I liked the 2008 festival's location on Žofín's island (Slovanský ostrov) as much as this year's because it also had more elbow room and the view of Prague Castle from the river. For my first taste, I decided to skip the mostly simple sushi offerings from Sakura right by the entrance, and headed to the Ambiente Restaurants stand. I was disappointed they had sold out of the 50-day aged Czech beef. That sounded interesting. 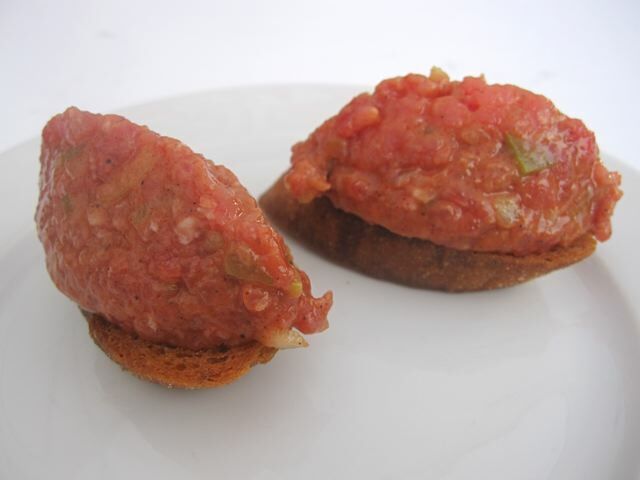 Instead, I had their beef tartare. It cost 4 Grands (100 CZK). 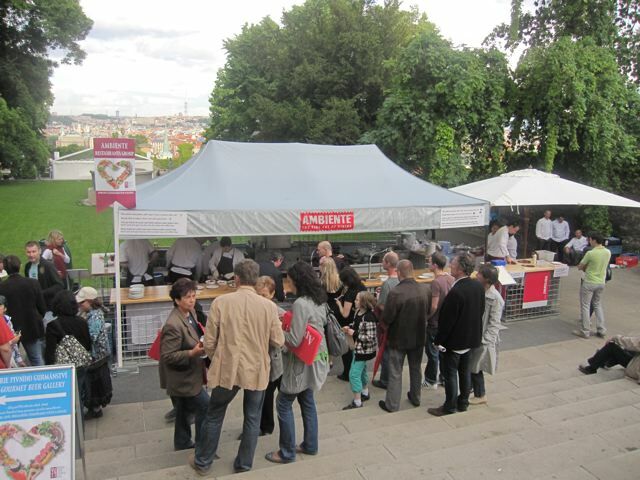 All food must be purchased with tickets called Grands, worth 25 CZK each. 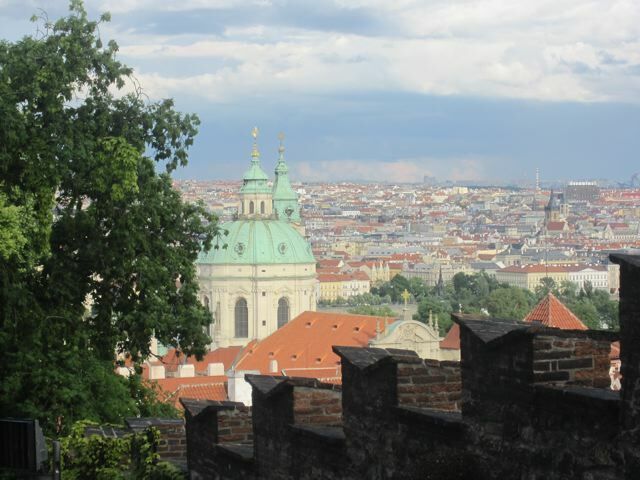 With the 400 CZK entry fee, you get 250 CZK worth of Grands. On top of that, I purchased another 500 CZK worth. The beef was pristine on the freshly fried little pieces of bread. Very good quality. The dominant flavor was that of pickle and/or pickle juice. It was simple, but I really liked the clean, clear flavor. I was glad it wasn't overloaded with other condiments like ketchup, mustard, and egg yolk. Then, I checked out the offerings from the Rickshaw Restaurant at the Corinthia Towers Hotel. 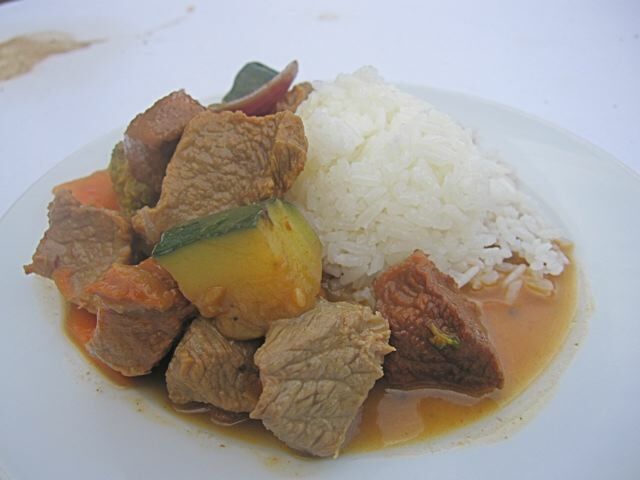 I got the beef masaman (125 CZK). The sauce was more like a thin curry broth. The portion of beef was generous, but some chunks were tough, while others were tender. There was wilted broccoli. It also came with rice. Later, I regretted eating all of it. I had come to the festival hungry. Too hungry. And finishing a big, unsatisfying dish was a strategic mistake. I headed over to see what they had from Le Grill at the Hotel Kempinski Hybernská. 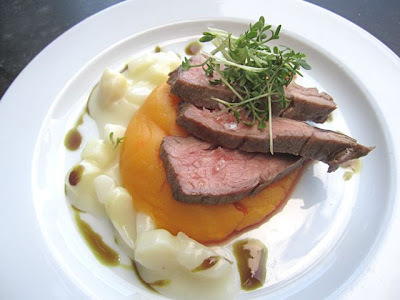 I chose the grilled flank steak with sweet potato purée, creamy white asparagus and pumpkin oil (150 CZK). It looked very nice on the plate. The beef had a rich flavor but was not very tender. The sweet potato was disappointing. It had its natural flavor, but was bland. In contrast, the quality of the asparagus, which is in season, stood well on its own. I stepped over to see what Buddha-Bar was up to. 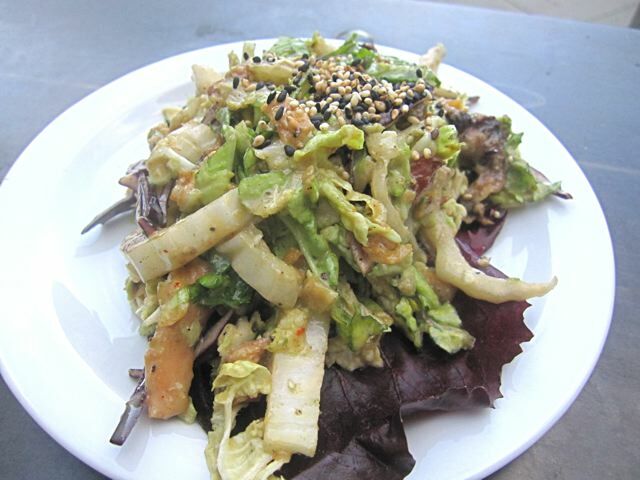 They were serving my favorite dish from my visit to the restaurant: Buddha-Bar Chicken Salad (100 CZK). The person in front of me got the last portion, and they told me to come back in 20 minutes. Twenty minutes later, I had my salad, and it was worth the wait. It was as good as I remembered, with a sweet and creamy sesame-soy dressing, Chinese cabbage, and crispy noodles. The portion size was generous, and I saw many other diners happily munching away. At the stand for Essensia at the Mandarin Oriental, I was tempted by the beef cheeks glazed with pepper sauce, but it had one of the highest prices of any dish. So I got the lacha porota (100 CZK). 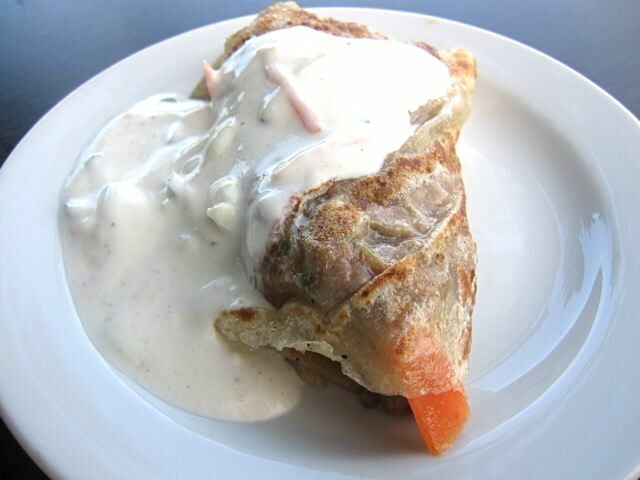 The perfectly delicate dough was filled with tender tandoori chicken and vegetables in a spicy gravy. A tangy yogurt sauce spread out on the side. It was filling (maybe too much so), but not too expensive, and another favorite of the festival. I had been so focused on food, I forgot to drink anything. 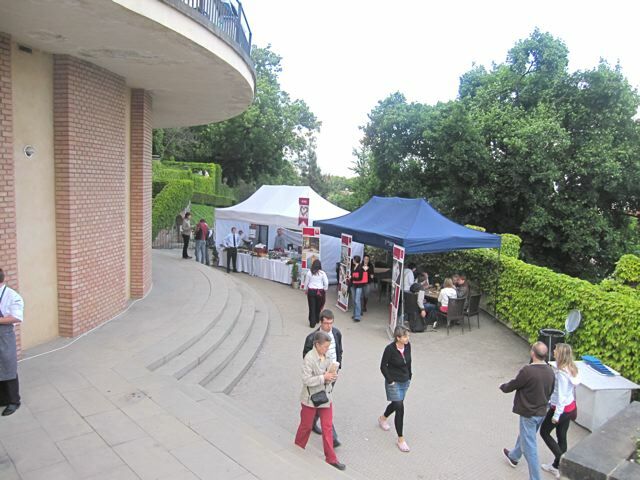 Fortunately, a Potrafena husa stand was nearby. 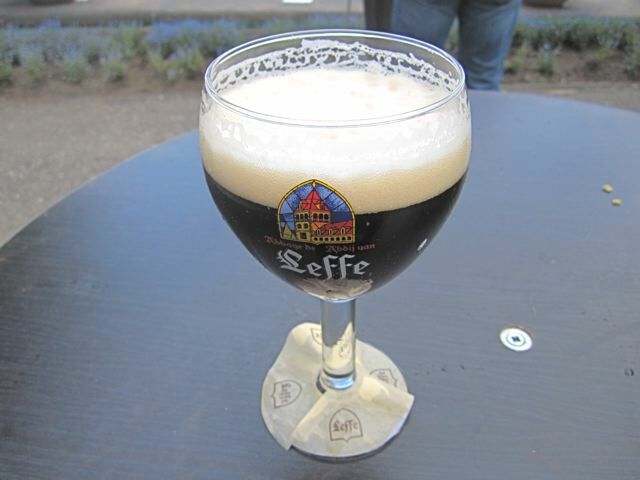 I much enjoyed my glass of Leffe Brune (25 CZK). I headed down to a lower garden and found some other high-end restaurants had stands down there. It was late, the festival ended at 9 p.m., and I hovered in front of the Mlynec chef, trying to decide if it was worth my last Grands. While I stood there, he put together a plate of marinated cod in sashimi sauce with potato purée and a hint of wasabi (100 CZK). Then, he handed it to me and said, "Don't worry about it. It's free." The festival was ending soon, so he was happy to clear some of his extra stock. I love cod, and this fish was absolutely delicious. It was fresh and delicate, and every bite was a pleasure. 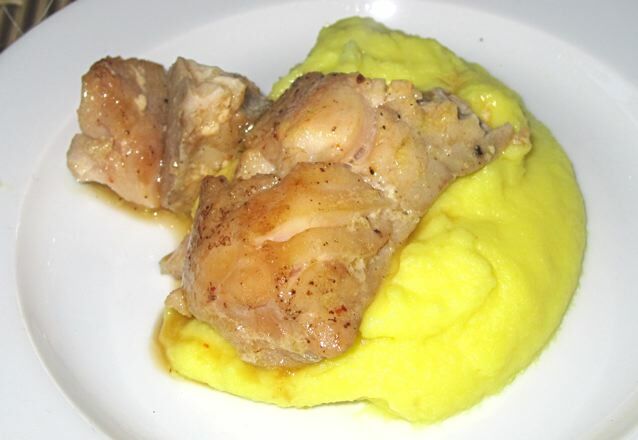 The mashed potatoes did have a nice wasabi flavor, but the texture was too smooth for my taste. It was cold, and I still had those extra Grands. The pancakes with real chocolate sauce at Le Grill looked tempting, but I was too full for such a heavy desert. So I went back to Buddha-Bar and asked for their small, delicate chocolate-sesame bars (50 CZK). And there, the woman won't take my Grands and tells me it's free. Even though I didn't pay for these either, I have to tell you the truth: they were great. 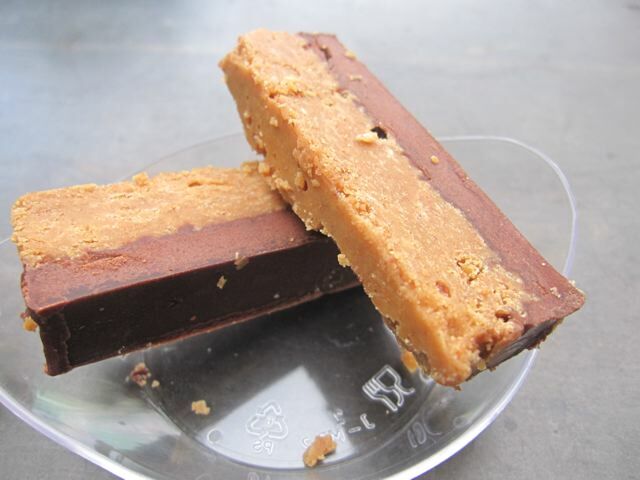 The chocolate was smooth and creamy, while the sesame side gave it a salty-crunch counterpoint. I barely resisted the temptation for ask for more to take home with me. But there I am, completely stuffed, and can't get rid of my last five Grands (125 CZK). The best I could do was order another Leffe Brune and sip it while I took in a performance of a very talented Spanish guitar band. The audience was small, and it was a pleasing contrast from the thumping synth music and big crowd that was in the same tent when I arrived. Of course, one person can't do it all at an event like this. Not even close. For another perspective on the festival, with many more pictures and a lot of different dishes, you can find it on the new foodie blog, Knedliky, etc. The Prague Post also had a preview/overview article. As for me, I really wish I could have tried more dishes. There were plenty of restaurants I was interested in, but I had no stomach room left. I needed to be more precise with my gluttony. Perhaps I did not always eat wisely, but for the most part, I did eat well. It's incredible that you drink a belgium beer instead of a good micro beer from Prague. Do you have any idea of what's a good beer? Relax. I was thirsty. That's what they sold there. And the Leffe Brune was pretty tasty. I respect the crusade of people like Pivni Filosof to promote better and more diverse beers in Prague. But it's not my crusade. So chill, baby. haha "Do you have any idea of what's a good beer?" .. come on.. There is nothing wrong with Leffe Brune.. Furthermore does the anonymous writer suggest that in Czech Republic people cannot drink foreign beer anymore.. Besides I think it is a nice picture of the glass.. 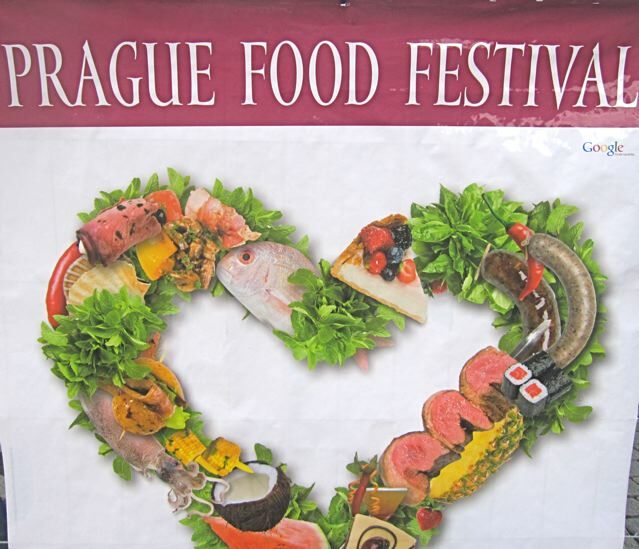 Regarding the food festival here in Prague, I think it's a good thing too. But I am less than impressed when the entry fee / "grands" books often only buy slightly more than one single entree at many of the stands. BTW, am I the only one in this context to find it amusing that a grand in the English-speaking world usually means 1,000? I happen to be on an expat salary so forcing me to make multiple trips to the coupon sellers is more annoying than prohibitive, but we already know of the decent food now available in this town. Shouldn't this be about getting Jan Novak (the Czech John Doe) out there and tempting him and his girlfriend to try new stuff? The prices in this case are (still) quite a bit too high.